Give into the siren song of the pools and beaches of the nation’s oldest city! Looking for a place to cool off in St. Augustine, Florida? Check out these swimming spots! Escape the occasional bout of oppressive heat and cool off in St. Augustine swimming holes. When the bay breeze isn’t cutting it, there are a few ways to beat the heat without throwing up your hands and heading indoors. From swimming pools to beaches to splash parks, I’ve got you covered on the ultimate guide to where to swim in the St. Augustine area. After all, you have come to Florida for vacation. It is a Florida vacation crime if you don’t enjoy some water at some point while visiting us. It’s in the vacation guidelines, I swear. 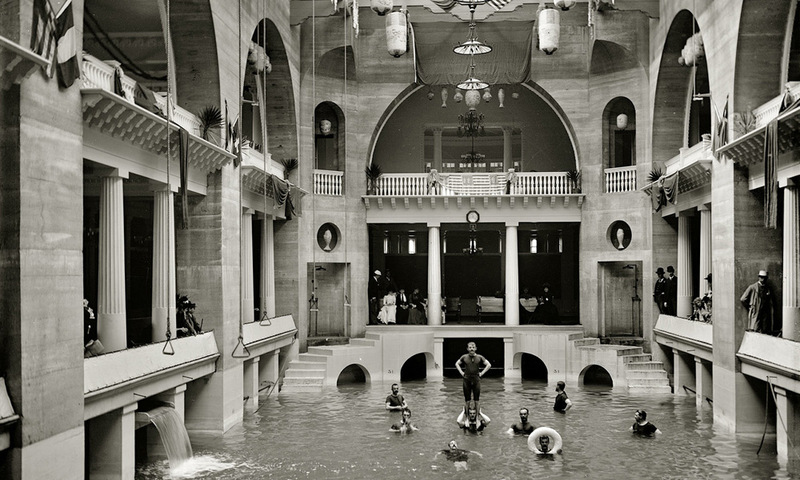 Vacationers sometimes overlook the water culture of St. Augustine which can be pretty easy to do—we are swimming in history. But that’s only half the story. There is so much more to St. Augustine than ancient streets and historic homes. Not that we need any more than that—it’s a pretty killer resume all on its own. As part of the Sunshine State, the sparkling pools and beautiful sandy beaches are standard, but St. Augustine excels at adding its own brand of charm to everything we offer visitors. 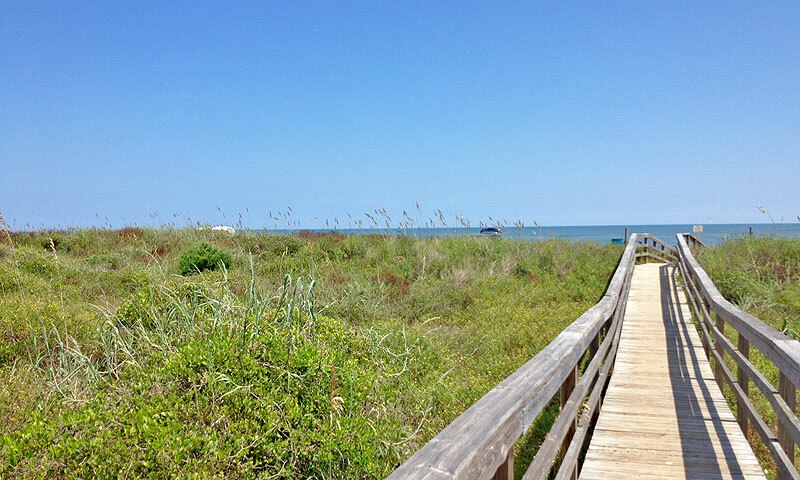 Below, you will find the ultimate sun seeker's guide to places to swim in St. Augustine. Pools are sometimes an overlooked feature of coastal Florida living. Whether you are a Florida resident or from out of state, you’ll probably want the option of a swimming pool in St. Augustine. There are, inevitably, those days where you just can’t bring yourself to walk anymore. After all, historic St. Augustine can be quite the cardio workout. When that happens, a pool is a refreshing, low-key option to relax. Beach life is not for everyone. Sure, the view is gorgeous, but there are reasons why kicking off your flip-flops and trekking across the sand may not be ideal. I mean, the sand alone can be enough of a deterrent. Seriously, it gets everywhere. So if water sans sand and sea creatures sounds like your Florida dream, you are in luck. I happen to know a few pools around the area. These swimming pools provide the perfect alternative to the beach. There are certainly benefits to enjoying a dip in a swimming pool in St. Augustine—no riptides, no wildlife. Which means you can play sharks and minnows without actually having to worry about, well, sharks and minnows. First up is the Willie Galimore Recreation Center. Operated by the St. Augustine Family YMCA, this seasonal swimming pool is $2 flat rate for ages 13-59, and $1 for children under 13 and seniors. Be sure to grab a towel and check the open swim times before heading out! Visitors to St. Augustine can also check out the Solomon Calhoun Community Center. There are specified hours for this pool as well. Rates are $1 for children, $2 for adults. Multi-use cards are available to purchase. An $8 card for children and a $13 card for adults covers 12 swim sessions. Annual passes are $110. Call the pool hotline to check weather status of Solomon Calhoun pool at (904) 209-0380. For those of you that want a more leisurely approach to pool life, you can book a hotel with a pool. That way, you can swim laps in luxury from the convenience of your lodgings. The Casa Monica, Historic Hilton Bayfront Hotel, and the Best Western Bayfront Inn all allow you to tour the ancient city and enjoy watery shenanigans without ever having to move your car. Not a bad setup at all. If you are the type of traveler who shies away from traditional lodging options (or you want to have an Emersonian experience on your vacation), check out North Beach Camp Resort. They offer RV hook-ups, cabins, and a pool. North Beach Camp is situated between the North River and the Atlantic Ocean. And if the sun has left you hungry, you can grab some food at Aunt Kate’s and get a beautiful view of the river. You can also dine beachside at The Reef. Perfect. Day. One of the hardest parts about traveling in a group is making sure everyone’s interests are met. That can be a challenge if your group is split between beach-lovers and swimming pool-lovers. Luckily, there are some places that combine both interests, meaning Operation: Relaxation can flow smoothly, just like you planned. I like to call these places combo packs. These hotels are located right on the beach, providing enviable views of the sea. That also means you have the opportunity to snap some beautiful pictures and send them to all your friends back home. I’m not going to lie to you, being able to swim in a pool and see the beach is pretty nice. For those with small children, a day at the beach may not be the right fit. Much like the beach/pool combination, the St. John’s County Ocean Pier offers visitors another opportunity for a cinematic ocean view without fully committing to the beach scene. 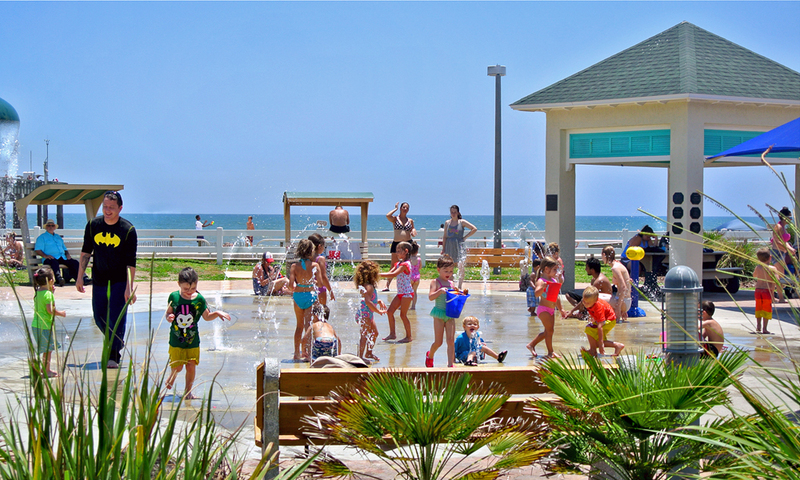 At the Splash Park, kids can hop around the splash pad and enjoy being squirted by water. The Splash Park also features a playground with sand. Kids can build sand castles without having waves crash into them or their masterpieces. I took my adorable two-year old niece here when she and her mom visited me. It was definitely the right call—it made letting my niece run (slightly) wild extremely manageable. She splish-splashed in the water jets for hours. I’m pretty sure I scored major cool-aunt-points for this excursion. Well, that combined with our trip to nearby Rita’s Italian Ice for frozen custard. Sometimes, a view of the beach just isn’t going to be enough. 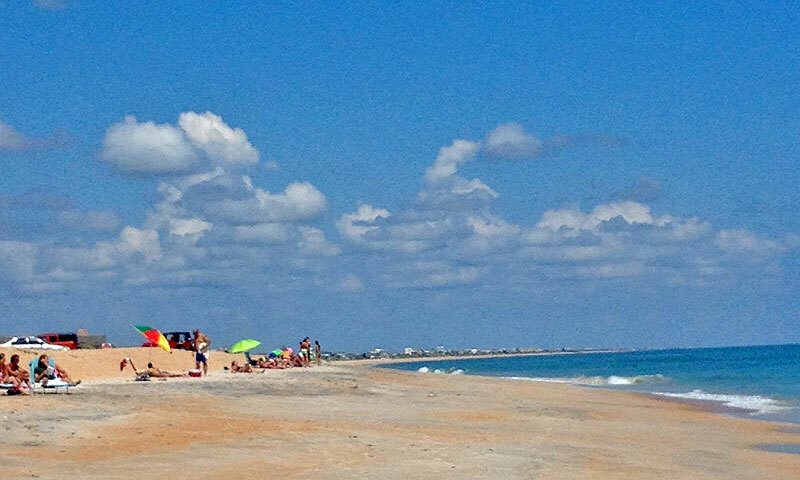 In the St. Augustine area, we have some pretty awesome beaches. In a small stretch of coast, we have a striking variety that sets us apart from other places in Florida. I’m probably a bit biased. I have loved St. Augustine since my first visit. I was ten, and a New York transplant living in Florida’s Gulf Coast. I didn’t move to St. Augustine until college, so I spent my formative teenage years at beaches that could double as bathtubs. While that sounds lovely, when the ocean is basically as hot as the air…there is no relief. But during the summer, the water in St. Augustine is perfect. Between May and September, the average ocean temperature fluctuates between 77 degrees and 84 degrees. That’s the Goldilocks formula right there—not too hot, not too cold. Just right. Beyond temperate waters, our beaches represent a wide range of ecosystems. We’ve got beaches with coquina deposits, beaches with white sand and slight dunes, and beaches with sands the colors of the sunset—each one an experience all its own. St. Augustine Beach has a lot to offer beach enthusiasts, whether they’re looking for a place to skim board, surf, swim, sunbathe, or take their canine best friends. One of the other bonuses to St. Augustine Beach is the ability to drive onto the beach in certain areas. Of course, make sure that your car has four-wheel drive and please stay away from the soft sand. I made that mistake once (all right, twice) in college. I made the mistake so now you don’t have to. You’re welcome, fellow beach bunnies. If you need to refuel after swimming and surfing, there are a variety of dining options like Sunset Grille and Mango Mangos close by. Hands down, Vilano Beach is my favorite place to spend a spare Saturday afternoon so long as I have a good book in hand. Then again, I am almost never without a book in my bag. It comes with the academic territory, I suppose. And, for the forgetful beachgoer, there is a Publix supermarket just over the Vilano Bridge. It is loaded with skim boards, flotation devices, chairs, bottled water—everything you need to make your beach outing a complete success. The area also features a few restaurants like the Caribbean-themed Beaches and Puccini’s Pizzeria. At Beaches, you can show up in beachwear making the transition from shore to table pretty easy. They are also pet-friendly. Another bonus. Located south on A1A, Washington Oaks Gardens State Park is a bit of a drive, but I promise it is worth it. Washington Oaks has a lot to do on-site, including the ability to take a stroll through the beautiful botanical gardens. But our concern today is the shoreline. The shoreline is wild—pieces of flat coquina jut into the water, creating an unmistakable sense of awe. Or, what I like to call, the Ariel Effect. It’s pretty hard not to picture The Little Mermaid sitting on top of one of these coquina formations as the waves crash against them. And this beach is a great, exotic photo op. What I’m trying to say is that this beach is completely Instagram-able. No filter necessary. If you have made it all the way out to Washington Oaks, you are an absolute trooper and I applaud you. Since you drove all that way, you may as well stop at Marineland. This is the kind of swimming you won’t want to miss (especially for those of you traveling with children). “The Immersion Program” at Marineland gives you the once-in-a-lifetime opportunity to swim with bottlenose dolphins in shallow and deep water. Yes, you read that correctly—swimming with dolphins is a thing you can do in this fair city. You will definitely want to make reservations for this option. Whether you are at the swimming pool, splash park, or beach, sunscreen is super important. When selecting a sunscreen, try to grab one that is SPF 30 or higher, water resistant, and has broad-spectrum coverage. Reapply every two hours. You will thank me for it later, promise. I do not go to the pool or beach without a pair of sunglasses, sunscreen, and a hat. Ladies, floppy hats are not only functional, but they are fashionable. And fellas, baseball caps are always in. Forgotten these pool and beach essentials? That is completely okay. As a town, St. Augustine tries to make sure that we supply what you need. Places like Alvin’s Island and Aqua East Surf Shop are great options to pick up last-minute items. If you do wind up with a burn, aloe can be your new best friend. But let’s try to avoid that all together. Take the preventative measures before you enjoy the sun and the water. If you are beachin’ it for the day, it is not only important to know where to go, but it is also important to make sure that you are staying as safe as possible. Every swimmer should be aware of the potential presence of rip currents while going for a dip in the ocean. After all, we want your vacation to be as relaxing as possible. That means you should know what to look for when you are out in the ocean. Rip currents are visible water disturbances so be on the look out for dirty-looking, choppy water. There is a good chance that that disturbance is a rip current, so avoid going into the water if you see this. For more information on rip currents, visit here. Rip currents are a pretty common local phenomenon, so you definitely want to be able to identify the signs. As we discussed earlier, beaches mean there is a potential for marine life. Remember, you are swimming in their home so use appropriate caution. Now you know how to go from brick-paved streets to pools and beaches in a matter of minutes. Your summer vacation is now as it should be—breezy, sun-soaked, and full of water shenanigans. This article was originally written in 2014 and has been updated to reflect information for 2018. Great page, glad I found it! Wonderful site. We are moving to St. Augustine after school is out. How Pet-Friendly is St. Augustine?